Holiday in the Park at Six Flags-St Louis. Celebrate the Christmas season the Six Flags way! The park will be decorated for the Holidays with thousands of lights, most rides will be open, Santa and his helpers will be in the park for personalized meet-and-greets, plus special food and lots more fun! See website for more information and to purchase tickets; one day and season passes are available. Holiday in the Park hours are limited and on select dates of operation, November 23rd - January 1st. Friday, December 21st through Tuesday, January, 1st (Closed on Christmas Eve and Christmas Day). See website for hours of operation on each date. 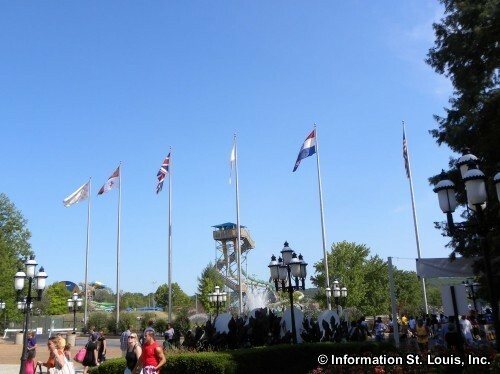 Six Flags St. Louis is located in western St. Louis County in Eureka, Missouri and is known for its thrill rides and family entertainment. The park is open from early April through October. In October, the park is open only on weekends for what is called "Fright Fest," a month long Halloween Party! Hurricane Harbor, adjacent to Six Flags, is a 12-acre water park that is free with admission to Six Flags St. Louis. Hurricane Harbor is open from late May to early September. Special live music concerts are held throughout the summer months at the Old Glory Amphitheater, located in the park. Tickets to the concerts held at Old Glory are an additional fee to the park admission price. Directions: Located in Eureka, Missouri, from I-44 take Exit #261-Six Flags Road, go north less than one mile to park entrance on the right.